The Siemens SITRANS LR460 is a 4-wire, 24 GHz FMCW radar level transmitter with extremely high signal-to-noise ratio and advanced signal processing for continuous monitoring of solids up to 100 m. It is ideal for measurement in extreme dust. SITRANS LR460 provides excellent results even during conditions of extreme dust. The integral Easy Aimer included on the SITRANS LR460 allows for easy positioning for optimum measurement on solids. Process Intelligence onboard SITRANS LR460 means advanced signal processing is harnessed for reliable operation on both simple and difficult solids application. The SITRANS LR460 level transmitter features a robust enclosure, flange and horn components. It is virtually unaffected by atmospheric or temperature conditions within the vessel. An optional dust cap is available for sticky solids. Optional air purging is also available for extremely sticky applications. Safe on-site local programming is simple using the Intrinsically Safe handheld programmer. SIMATIC PDM can be used for easy remote programming using HART or PROFIBUS PA. The characteristics of 24 GHz and high signal-to-noise ratio contribute to exceptional signal reflection, regardless of the dielectric value of the medium. 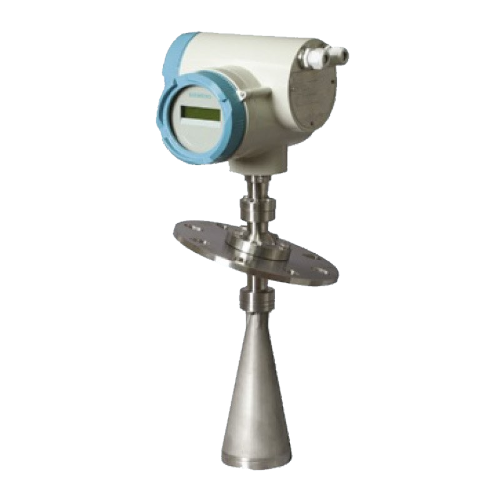 The SITRANS LR460 is a 4-wire, 24 GHz FMCW radar level transmitter with extremely high signal-to-noise ratio and advanced signal processing for continuous monitoring of solids up to 100 m; it is ideal for measurement in extreme dust.